I took a shopping trip to Costco this past week and picked up a huge container of plums. Last time I bought plums there they were rock hard for days. In fact, they never really ripened. They were semi-sweet but were like crunching into an apple. This time I opened up the package and they were all soft. The kind of soft where you know if you don’t consume them pronto, they’re goners. So I decided on two things that I think will ultimately make my life easier in the future. Don’t buy plums at Costco anymore. When you forget that you shouldn’t buy plums at Costco anymore, and in turn have too many plums that are too ripe, make a plum galette! A galette is a general word used in France to describe flat, free form crusts. They are misshapen, irregular, and sometimes blemished in spots, and yet I think galettes make some of the prettiest desserts known. There is a simple beauty in its imperfection. Don’t think for a second that I missed the moral illustration involved in that one statement and this gorgeous galette. I am the first to admit that I’m imperfect. I wear my emotions on my sleeve despite my efforts not to, I struggle when I feel out of control in even the smallest of situations, when I’m upset about something I would rather shove it aside and try to move on instead of dealing with it right away, I’m afraid of way more than I should be, sometimes I let worry overcome me, and on a physical level, the health of my body seems to want to reject anything that resembles perfection time and time again. And amidst all of these imperfections the beauty in me remains in moments of courage, opportunities for strength, shades of grace, and times of health. This beauty that remains…is Jesus. He is so, so good when there is nothing good in me. Put oven rack in middle position and preheat oven to 375°F. Line a large (17- by 12-inch) baking sheet with parchment paper. Roll out dough on a lightly floured surface with a lightly floured rolling pin into a 13-inch round. Transfer to baking sheet. Stir together semolina flour and 2 tablespoons granulated sugar and spread evenly over dough, leaving a 1-inch border. Arrange plums, skin sides down, in 1 layer on top of sugar mixture, then sprinkle plums with 3 tablespoons granulated sugar. 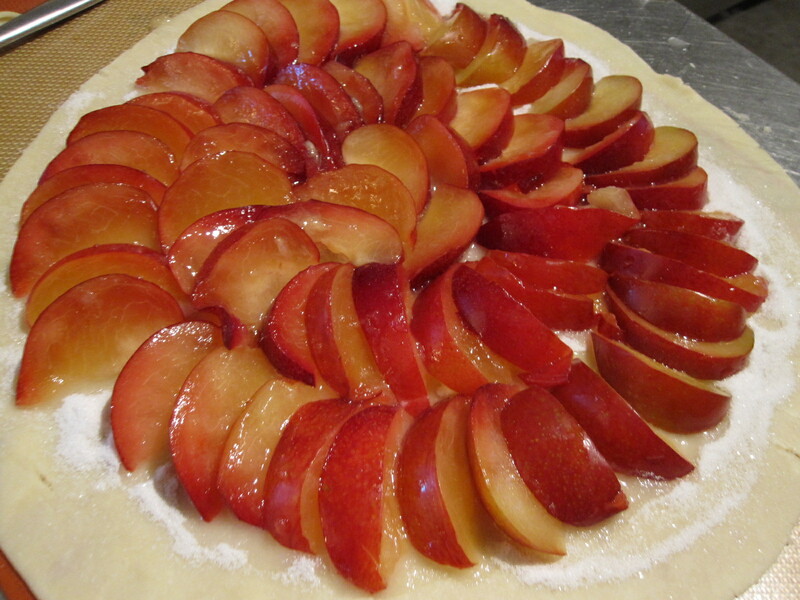 Fold in edge of dough to cover outer rim of plums, pleating dough as necessary. Bake galette, loosely covered with a sheet of foil, 40 minutes. 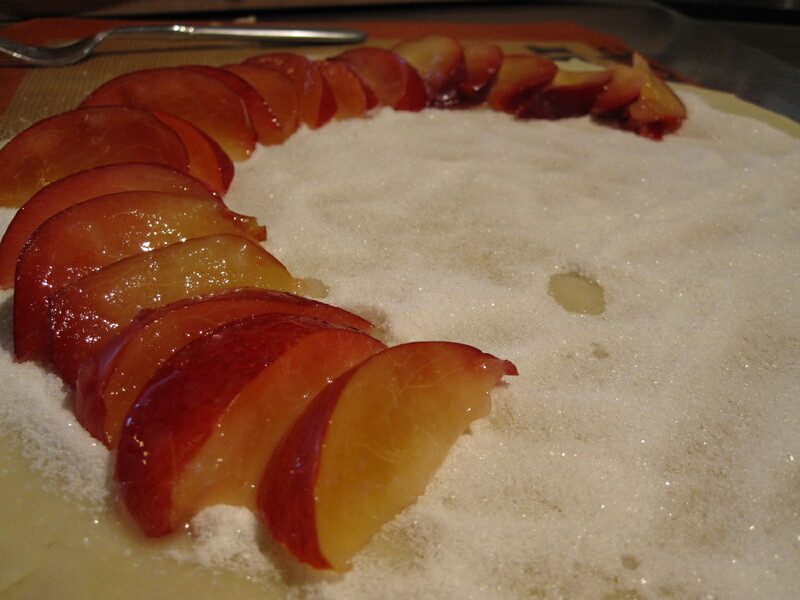 Remove foil and bake until fruit is tender and juices are bubbling, about 5 minutes more. 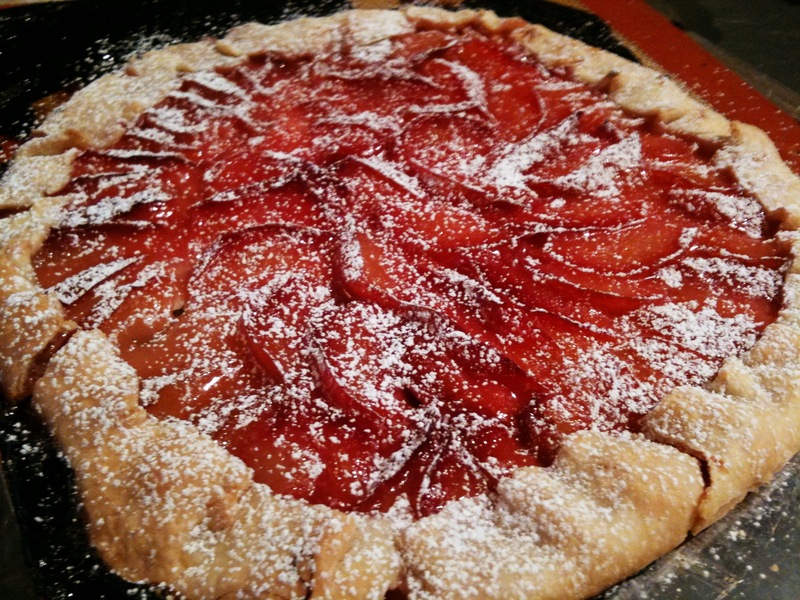 Transfer galette on baking sheet to a rack and immediately brush hot juices over plums using a pastry brush. 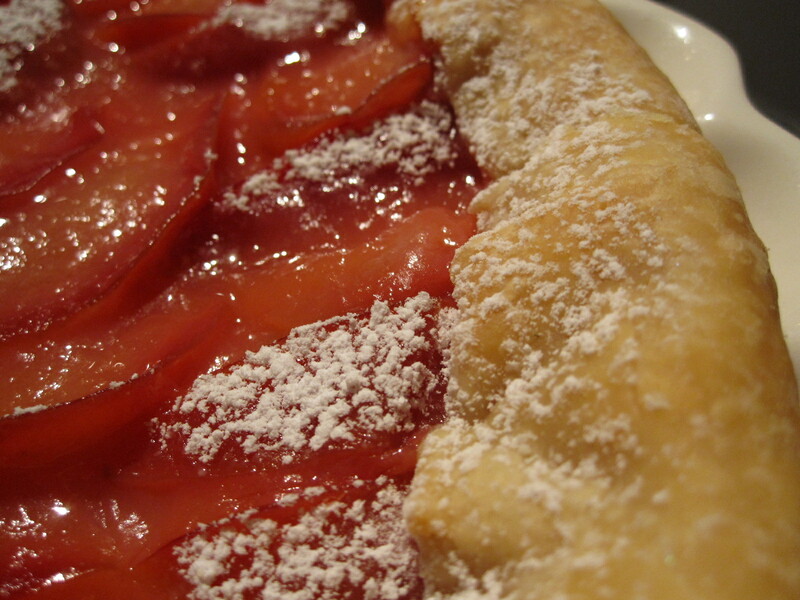 Dust hot galette with confectioners sugar (sugar will melt and help glaze galette). Cool to warm or room temperature, about 30 minutes. While galette cools, stir together crme frache, Armagnac (if using), and remaining 3 tablespoons granulated sugar in a bowl until sugar is dissolved. Serve galette with Armagnac cream. 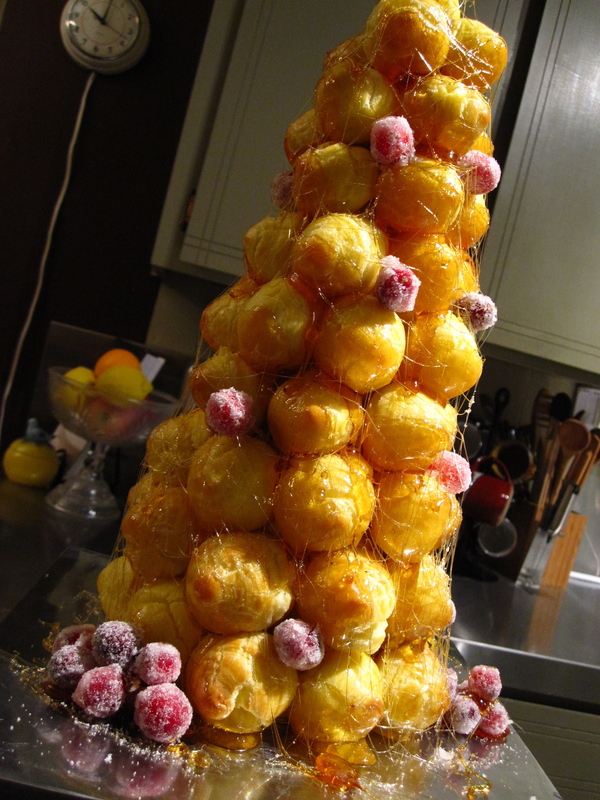 I can’t think of a better way to end the year than with the creation of a croquembouche. It epitomizes everything I love about French pastry. It’s stunning and yet simple, festive, and only solidifies in my mind what I want to do. I really love everything about this pretty creation, all the way down to the immense challenge that it presented. It was my mountain this year…and I like to think I reached the summit. Here are just a few of the things I positively adore about this mountain of sweet. Choux pastry turned into profiteroles. Butter, water, flour, and eggs. It doesn’t get more simple than this, and yet these gorgeous puffs take some serious determination and patience. Sugar spun into whispy threads. I learned how to do this from my baking mentor, Marda Stoliar, a couple of years ago, but hadn’t done it since. 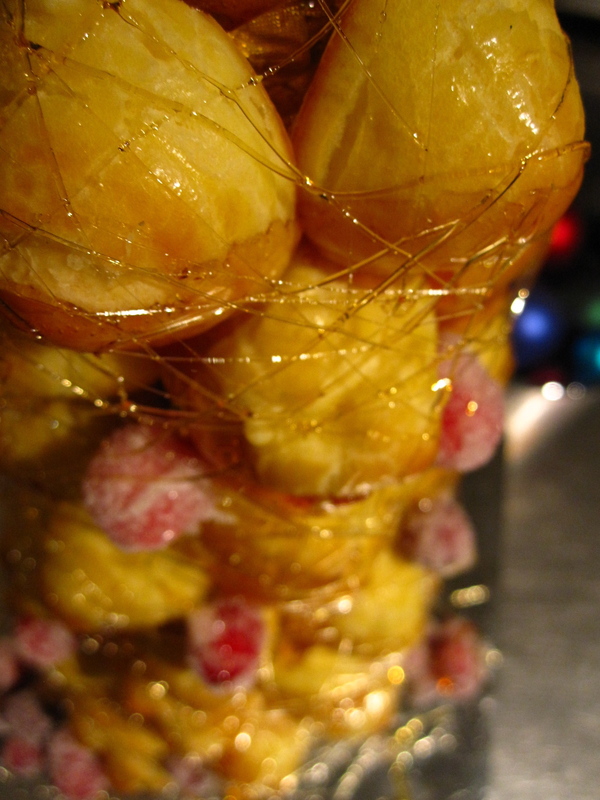 It’s what gives the croquembouche that magical look that it has. It takes some building. I love anything that makes me think in a more mechanical way about my creations. It’s not always my strong point, but it makes another part of my brain work, and that combined with the creative part of me makes me way too excited! The name comes from the French words croque en bouche meaning “crunch in the mouth.” You better believe I love that! Drain the ricotta in a fine sieve set over a small bowl in the refrigerator for at least 4 hours and up to 1 day. Warm the milk in a heavy-duty 3-quart saucepan over medium heat until steaming, 3 to 4 minutes. Meanwhile, whisk the eggs, egg yolks, and 1/2 tsp. salt in a medium bowl. Gradually whisk in the sugar. Whisk in the cornstarch and vanilla until smooth. Slowly whisk a little of the hot milk into the egg mixture to warm it, then whisk the mixture into the pot of milk. Whisk in the butter and cook over medium heat, whisking constantly, until the pastry cream is very thick and registers 165°F on an instant-read thermometer, 2 to 3 minutes. Strain through a fine sieve into a medium bowl. Cover with plastic wrap, pressing it onto the surface of the cream, and refrigerate for at least 2 hours. Purée the ricotta in a food processor until very smooth, about 8 minutes. Stir it into the pastry cream and refrigerate until ready to use or for up to 1 day. Position racks in the upper and lower thirds of the oven and heat the oven to 425°F. Bring 2-1/2 cups of water and the butter, sugar, and 1-1/4 tsp. salt to a boil in a 4-quart saucepan over medium-low heat. When the butter melts, remove from the heat and add the flour. Set the pan over low heat and stir with a wooden spoon until the mixture forms a smooth ball that pulls away from the sides of the pan, about 2 minutes. Transfer the mixture to a stand mixer fitted with the paddle attachment and beat on low speed until cool to the touch. On medium-low speed, beat in the eggs one by one, mixing until each is fully incorporated before adding the next. Let the dough cool for about 10 minutes. Transfer half of the dough to a pastry bag fitted with a 1/2-inch plain tip (Ateco #806). Onto 2 parchment-lined rimmed baking sheets, pipe small, 1-1/2-inch-high mounds (like chocolate kisses) at 2-inch intervals. Smooth the surface of the mounds with a wet finger. Lower the oven temperature to 375°F and bake, rotating the sheets from top to bottom after 10 minutes, until the puffs are evenly golden-brown, 20 to 25 minutes total. Turn off the oven and remove the puffs from the oven. Prick the side of each puff with a paring knife to release the steam. Return the puffs to the turned-off oven with the door ajar to dry them for 3 to 5 minutes. Remove the puffs from the baking sheets and transfer to a rack to cool. Repeat with the remaining dough on freshly lined baking sheets. Sort the puffs according to size: small, medium, and large. Transfer about half of the pastry cream to a piping bag fitted with a 1/4-inch plain tip (Ateco # 802 or #10). Poke the tip into the bottom of each puff and fill with the pastry cream, being careful not to overfill. Refill the pastry bag as needed. Have a large bowl of ice water ready. Put the sugar and salt in a 3-quart heavy-duty saucepan. Add 2/3 cup water and swirl to moisten the sugar. Cover and boil over high heat until starting to turn golden around the edges, 5 to 7 minutes. Remove the lid and cook, swirling occasionally, until the caramel is light golden, 1 to 2 minutes more. Immediately put the bottom of the pot in the ice water to stop the cooking. Remove the pot from the water and put it on a heatproof surface. Have a small bowl of ice water nearby. Put the foil-wrapped cone on a serving platter. Insert a toothpick about 1 inch from the base of the cone. Dip the side of a large cream puff into the hot caramel to coat the side and about a third of the top of the puff. Immediately press the cream puff onto the toothpick, with the top facing out. Insert another toothpick parallel to the first pick, positioning it so that the next puff will fit snugly against its neighbor. Dip another cream puff and nestle it against the first. Repeat, making your way up and around the cone, working from the largest to the smallest puffs. If you get any hot caramel on your fingers, immediately dip them into the ice water to stop the burn. As the caramel cools and thickens, it will begin to spin into long, thin threads as you pull the puffs from the pot. 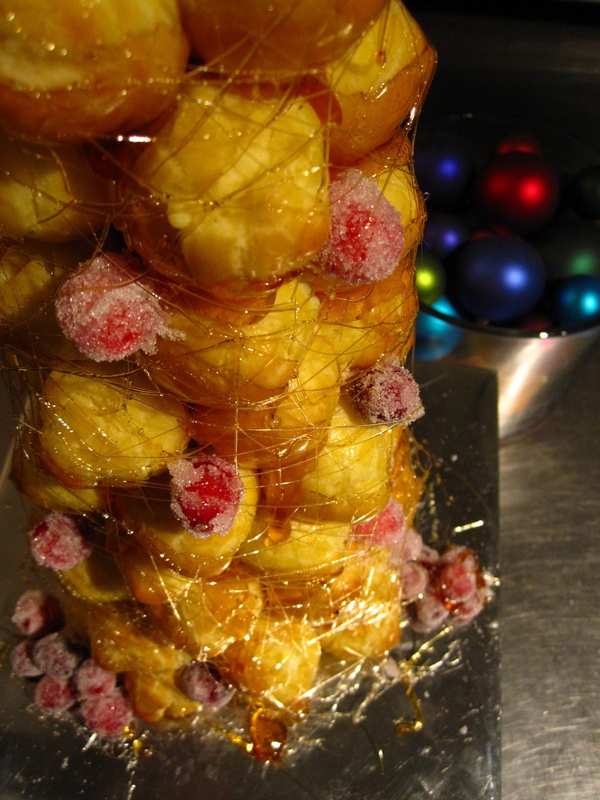 Before attaching the puff, circle the cone with the puff so the spun caramel drapes the croquembouche. When the caramel becomes too thick to dip, swirl it over low heat to thin it—it will darken a little each time you do this. When the cone is completely covered with puffs, dip a fork into the caramel and continue to pull the caramel threads from the pot and spin them around the croquembouche until you’re happy with its appearance. Serve any extra cream puffs on the side. The pastry cream can be made up to one day ahead and refrigerated, covered. The puffs are best used the same day they’re made, but they can be made one day ahead and stored (unfilled) in an airtight container at room temperature. You can assemble the croquembouche up to 2 hours ahead provided it’s not too humid; a moist environment will cause the caramel to soften. Don’t refrigerate the croquembouche.